By now it is very well documented that the XPS 15 9550 (review) and 9560 (review) have issues with thermal and VRM throttling. As I outline in the aforementioned page linked, there are actually two types of throttling that plague the XPS 15 series: (1) thermal and (2) power-limit. The former type of throttling is caused by high temperatures on the CPU and GPU. Undervolting and repasting tend to take care of these issues to a fair degree for the CPU. Keeping the GTX 1050 in the 9560 from throttling proved to be nearly impossible, however. Pascal (10-series) Nvidia chips tend to have a soft limit of around 79C, at which point they will reduce clocks. Putting thermal pads over the GPU’s heat spreader lowered GPU temperatures at first, but ultimately resulted in expediting the latter (and more pernicious) type of throttling: power-limit. Power-limit throttling in the 9550 and 9560 was caused by poor cooling of the voltage-regulator module, also known as the VRM. Without any cooling of their own, once VRM temperatures reached around 78C, a low power limit would be applied to the CPU, often dropping clocks to 800 MHz and bringing performance to a grinding, shuddering halt. 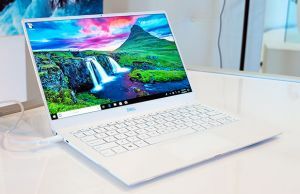 The community hoped that things would be different this time around, especially since the new XPS 15 9570 is using slightly more power-hungry (still with 45W TDP, however) hexa-core Coffee Lake H-series CPUs and a GTX 1050Ti. Unfortunately, the recently found XPS 15 9570 service manual suggests otherwise. 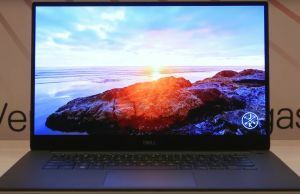 The XPS 15 9570 Service Manual shows a cooling system with no visible changes. In addition to no visible changes suggesting improved cooling to the VRM, it is clear that heat sink assembly is the same two-pipe variant. 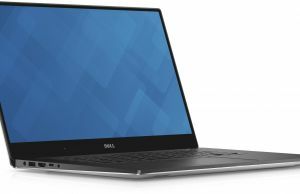 My experience with previous XPS 15s and the Asus Zenbook Pro UX550 has proved that two heatpipes are insufficient to provide cooling for even an undervolted i7-7700HQ and GTX 1050 — but the GTX 1050Ti even more so (thus why Dell has confirmed that the GTX 1050Ti ni the 9570 is a Max-Q variant. It would have been great to see a three-pipe cooling assembly or something more encouraging than this, but it’s also possible that the images could be from old photos of the 9560 for reasons of expedience. I intend to explore the cooling system in full once I get my XPS 15 9570 (if Dell could stop cancelling my and my resellers’ orders, that is). Gigabyte Aero 15X easily cools down i7-8750H and GTX 1070 Max-Q with 2 heatpipes. That's a fair point. I don't remember what the internals of my aero 15 looked like but I recall them being a significantly different design than the XPS 15's. You can't guess thermal performance just by looking at photos. It's much more complex than that. 1. Quality of components. Different VRMs perform differently at high temperatures. 2. Cooling policy(performance vs noise). Ultrabook manufacturers limit max RPMs to reduce noise. That can be fixed by custom BIOS. 3. Implementation details. If you take a closer look at UX550 cooling system, you may notice gaps between blowers and radiators, which ruin thermal performance.